To obtain information about Spark application behavior you can consult cluster manager logs and the Spark web application UI. These two methods provide complementary information. 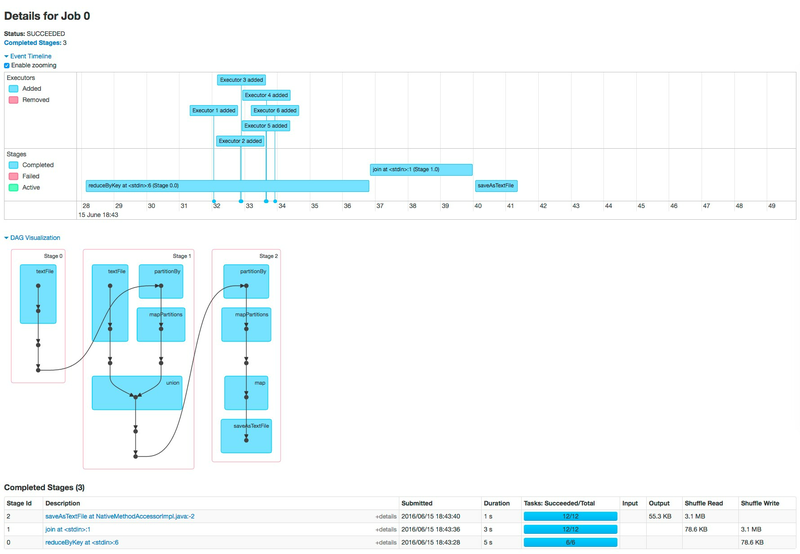 Logs enable you to see fine grained events in the lifecycle of an application. The web UI provides both a broad overview of the various aspects of Spark application behavior and fine grained metrics. This section provides an overview of both methods. For further information on Spark monitoring, see Monitoring and Instrumentation. 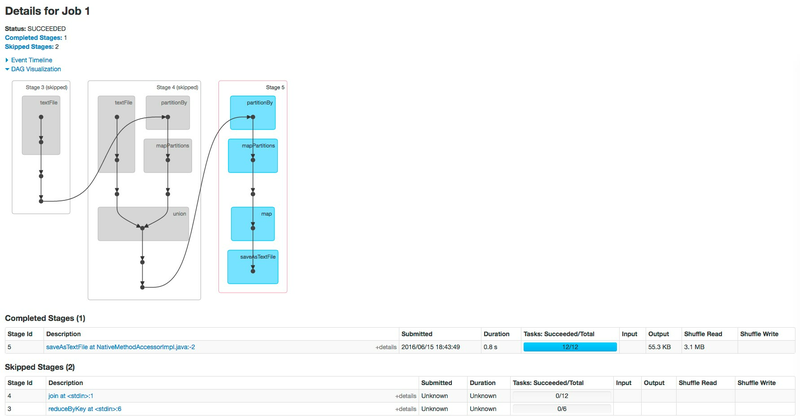 Go to the YARN applications page in the Cloudera Manager Admin Console. Open the log event viewer. Filter the event stream to choose a time window, log level, and display the NodeManager source. For any event, click View Log File to view the entire log file. The Spark service collects Spark driver logs when Spark applications are run in YARN-client mode or with the Spark Shell. This feature is enabled by default, and the logs are persisted to an HDFS directory and included in YARN Diagnostic Bundles. In the Cloudera Manager Admin Console, go to the Spark service. Search for the following configuration: Spark Driver Log Location. Change the directory specified in the field. Deploy the updated client configuration. Search for the following configuration: Persist Driver Logs to Dfs. An event timeline that displays the relative ordering and interleaving of application events. The timeline view is available on three levels: across all jobs, within one job, and within one stage. 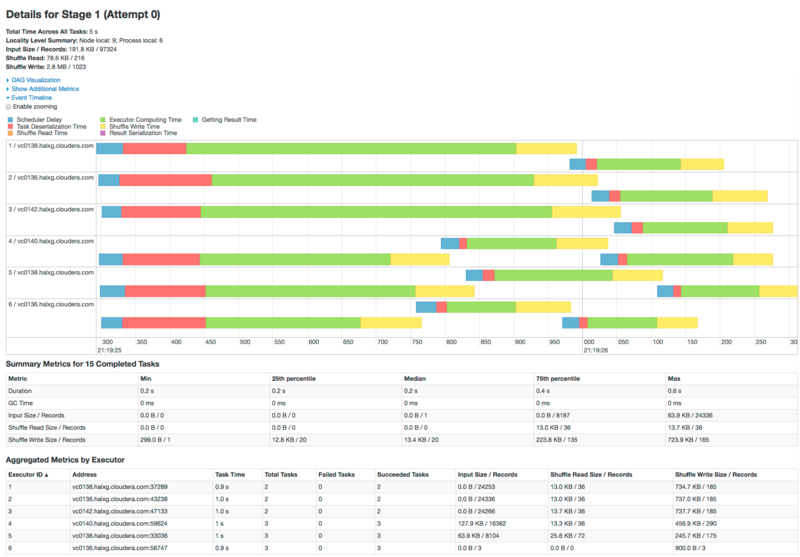 The timeline also shows executor allocation and deallocation. A list of stages and tasks. The execution directed acyclic graph (DAG) for each job. A summary of RDD sizes and memory usage. Environment - runtime information, property settings, library paths. Information about Spark SQL jobs. The web UI is available in different ways depending on whether the application is running or has completed. To access the web application UI of a running Spark application, open http://spark_driver_host:4040 in a web browser. If multiple applications are running on the same host, the web application binds to successive ports beginning with 4040 (4041, 4042, and so on). The web application is available only for the duration of the application. Click the History Server Web UI link. The History Server displays a list of completed applications. In the list of applications, click an App ID link. The application UI displays. Note: In CDH 5.10 and higher, and in CDK 2.x Powered By Apache Spark, the Storage tab of the Spark History Server is always blank. To see storage information while an application is running, use the web UI of the application as described in the previous section. After the application is finished, storage information is not available. 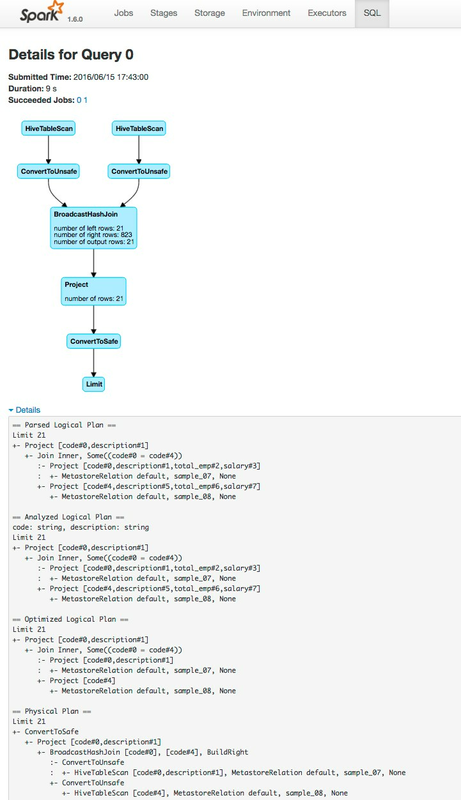 The following screenshot shows the timeline of the events in the application including the jobs that were run and the allocation and deallocation of executors. Each job shows the last action, saveAsTextFile, run for the job. The timeline shows that the application acquires executors over the course of running the first job. After the second job finishes, the executors become idle and are returned to the cluster. Pan - Press and hold the left mouse button and swipe left and right. Zoom - Select the Enable zooming checkbox and scroll the mouse up and down. Note: The following example demonstrates the Spark driver web UI. 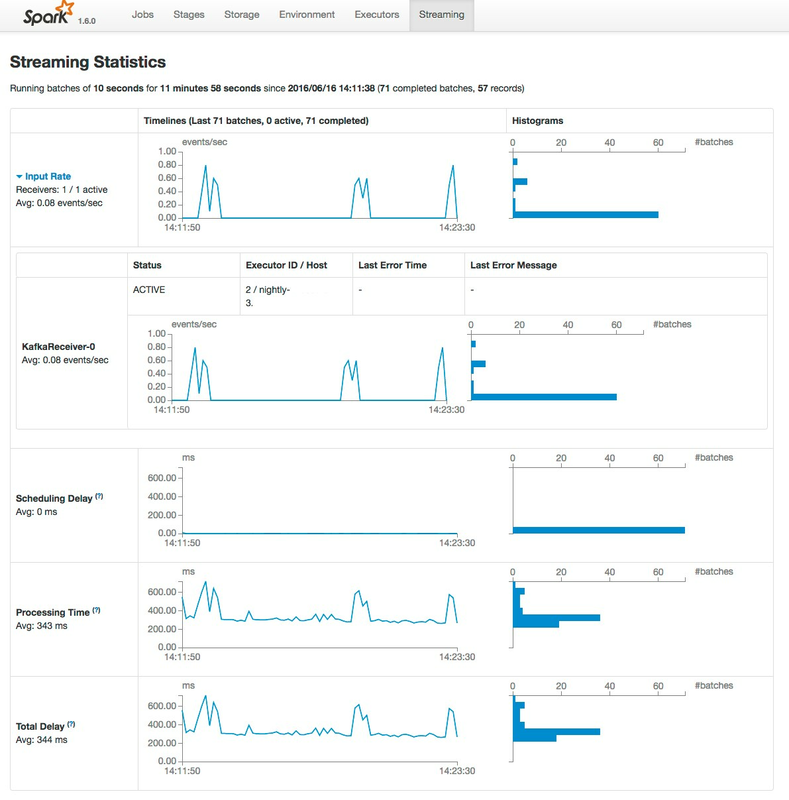 Streaming information is not captured in the Spark History Server.